QCNet Portal > Support > How do I back up my Unity Real Time 2.0 database? NOTE:The following instructions are for the Express installation of Unity Real Time 2.0. In the express installation the database is installed on a workstation and not a server. If your database resides on a server please contact your IT personnel for assistance. Click on the SQL Server drop down arrow and select ‘(local)’, Login Name type in ‘sa’, Password type in ‘biorad’ and select QCDAO from Database. You may wish to change the file name by editing the “File name on local hard drive:” field. If you wish change the location you can type it in or click on the ellipses box to select a new location. This utility can only backup to a local drive, you can then move the QCDAO.BAK file to a network drive or flash drive. 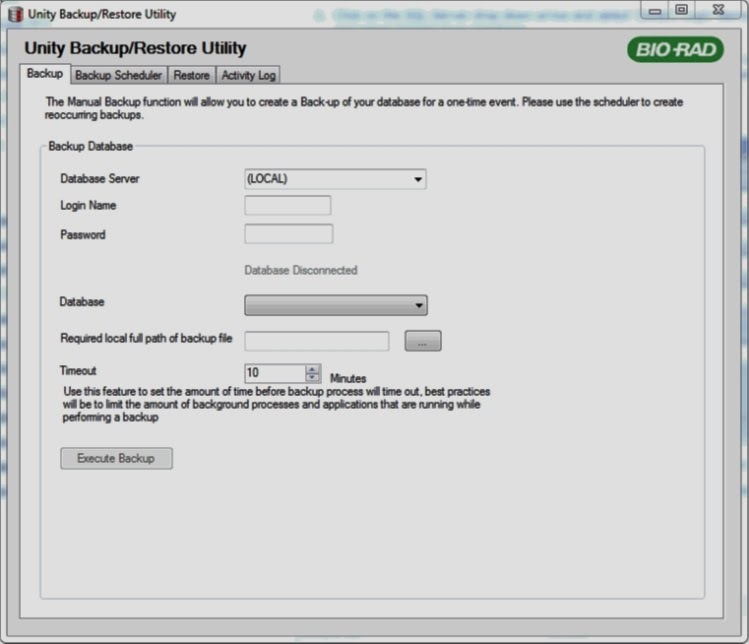 If you require further assistance please contact Bio-Rad Software Support at 800-854-6737 option 3 then option 1.